Since we seem to be on the topic of edible weeds we may as well discuss lambsquarters, another frequently present and commonly eaten, nutritious and versitile weed. Botanically known as Chenopodium album, it is a member of the family Amaranthaceae and therefore related to several common (and uncommon) agricultural crops, including spinach (Spinacia oleracea), beets (Beta vulgaris), Swiss chard (also Beta vulgaris), amaranth (Amaranthus spp. ), and red orach (Atriplex hortensis). Chenopodium, a genus consisting of 100 plus species, is also cultivated in various parts of the world for its edible leaves, stems, and seeds. 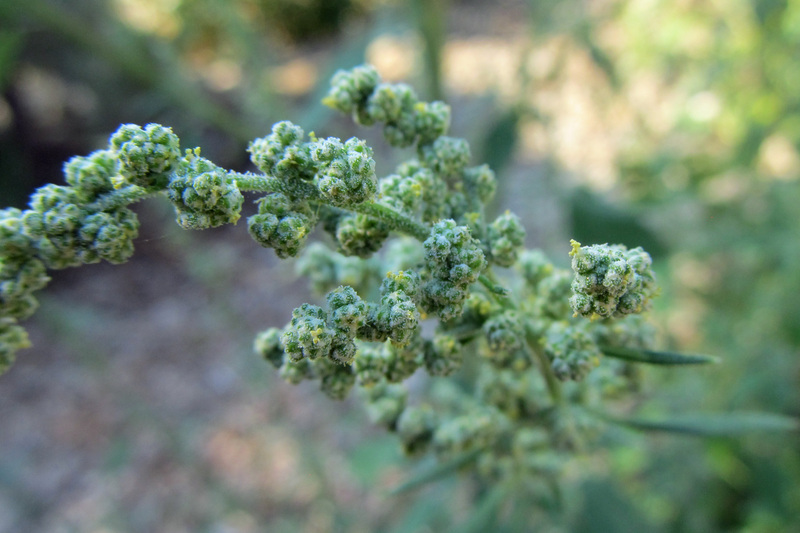 Chenopodium quinoa, commonly known as quinoa, is now a popular “grain” in North America after being grown for millenia by Andean cultures. 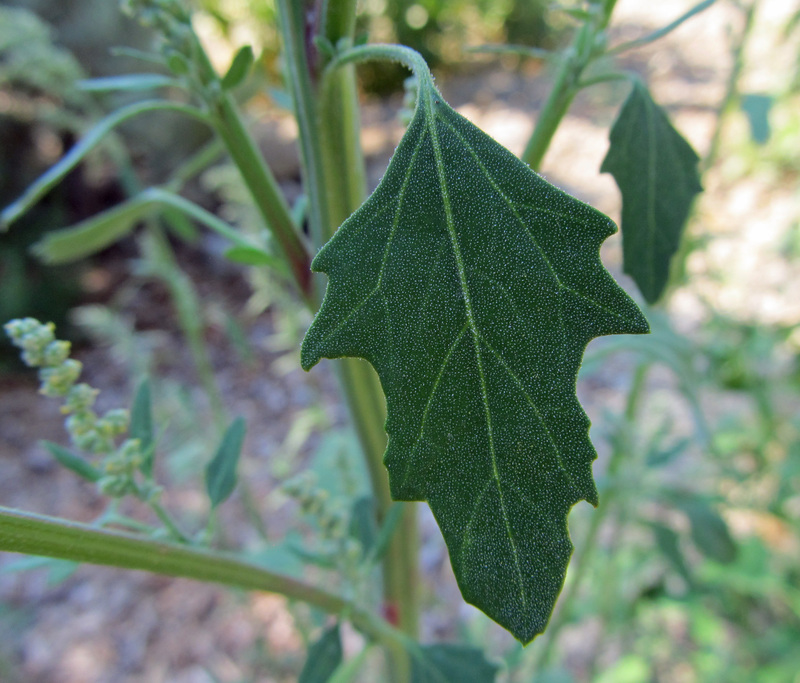 Chenopodium album is a summer annual that reaches up to 6 feet tall with sturdy, angular stems and triangular, diamond-shaped, or lance-shaped leaves with irregularly toothed margins. The leaves are green on top and mealy gray-white on bottom. 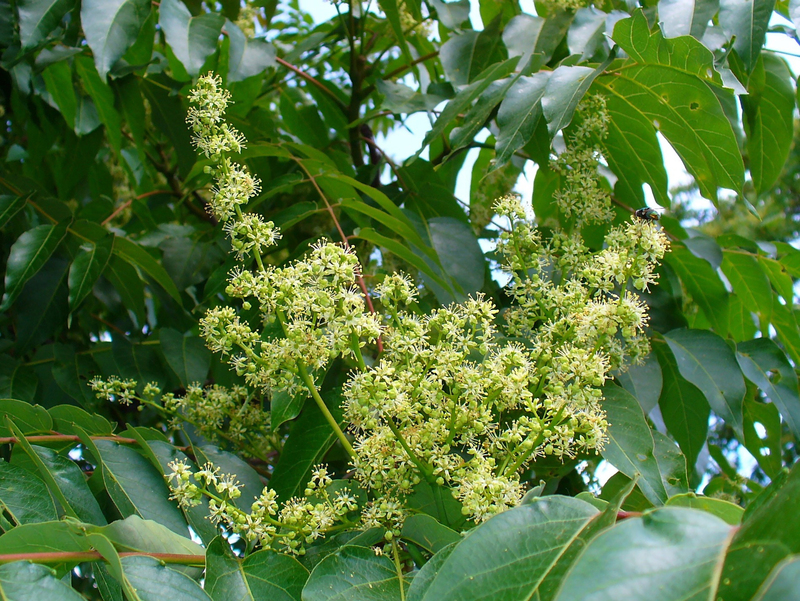 The flowers are tiny, petal-less, and organized in tight clusters at the ends of branches. In Botany In a Day, Thomas Elpel describes the flowers as “little green ‘globs’ forming along an upright stalk, sometimes colored with specks of yellow.” They are generally wind-pollinated, but are occassionally visited by pollinating insects. 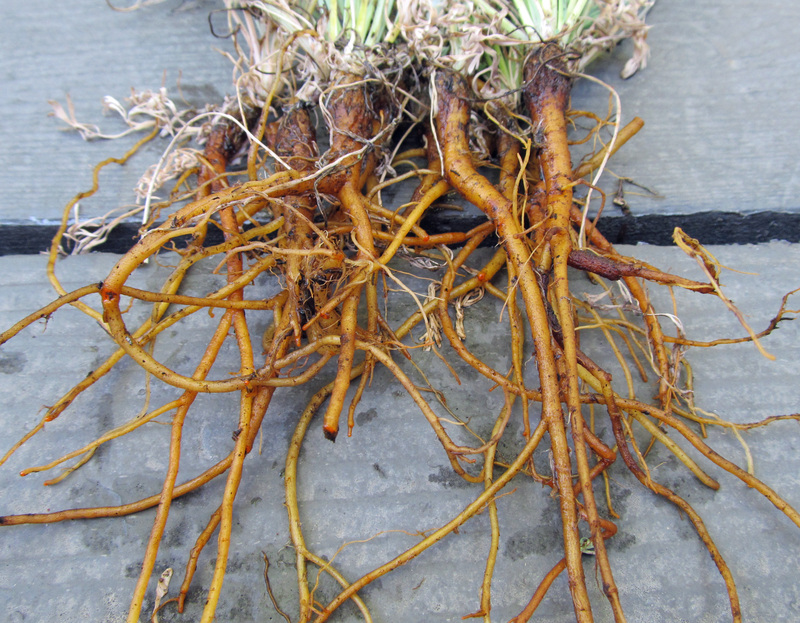 Each plant can produce tens of thousands of seeds, which are potentially viable for up to 40 years. Lambsquartes is one of many common names for C. album (others include goosefoot, fat hen, baconweed, mealweed, frostblite, and wild spinach), and is a name with several proposed origins. Is it because the plant is commonly found growing in the manure-rich soils of barnyards? Or is it because the fuzzy undersides of the leaves are reminiscent of sheep’s wool? Perhaps it is because per weight, the harvested plants and a quarter of lamb contain roughly the same amount of protein? Who knows? Despite all this talk of sheep, however, large quantities of lambsquarters are reported to be poisonous to both sheep and pigs. Eastman goes on to hint at lambsquarters’ potential for phytoremediation: “The plant accumulates high levels of nitrates and pesticides in addition to its oxalic acid content.” It also takes up heavy metals, including zinc, copper, and lead. This phenomenon is worth a future post, so stay tuned. That being said, when harvested from a non-polluted site, lambsquarters is a very nutritious spinach-like green both raw and cooked. Younger leaves and plants are preferred because older ones tend to be higher in oxalic acid. 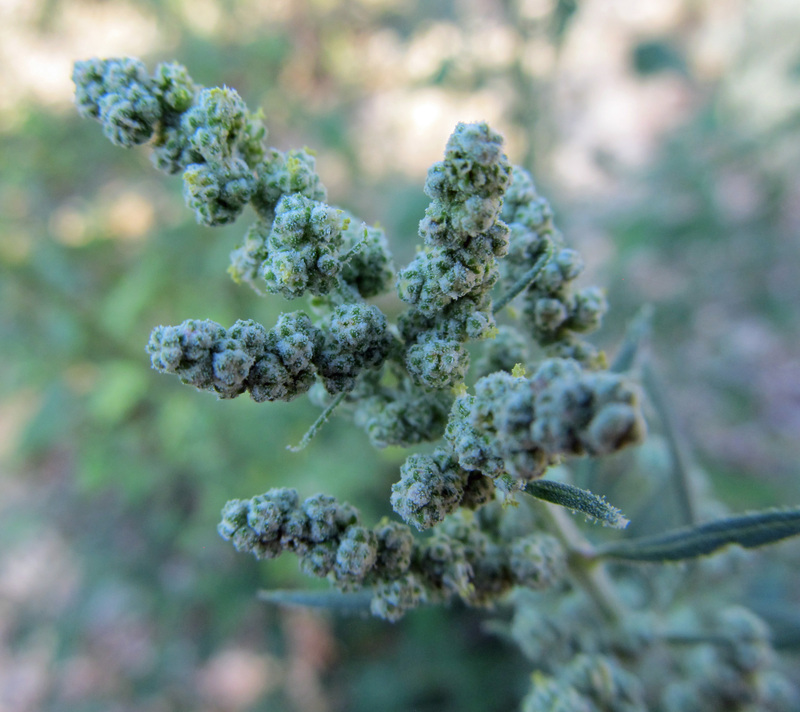 The seeds are also edible and, like quinoa, can be used in a similar manner as common grain and cereal crops. Harvester ants and various bird species also collect and consume the seeds. The roots of lambsquarters are high in saponin and can be used to make soap. Pfeiffer’s predictions haven’t quite come to pass, but time will tell. According to an article posted on LiveScience, lambsquarters is one of “The Five Healthiest Backyard Weeds.” The list includes two other weeds we have covered during the Summer of Weeds: Purslane and Plantain. I don’t work for a landscape company, nor have I ever worked for one. The company I do work for contracts with these companies to do health care on their landscapes. For example, we scout for insects and diseases, spray pesticides when necessary, make recommendations of proper cultural practices, and fertilize. Something has been bothering me for the past two years about the landscapes in metropolitan southeast Michigan. Both commercial and residential landscapes have at least two things in common: the same plants, and the same poor management of these plants. The clients have no idea they’re being ripped off. The landscape companies I have experience with seem to think the homeowner is always right. You want a Colorado blue spruce in humid Michigan? Sure, no problem. Let’s put six trees within 15 square feet. Don’t bother removing the cage and burlap. We also won’t tell you the massive expense you’ll pay in the future to spray fungicides on your spruce to keep it alive. If one dies, we’ll just replace it with the same plant. You want a green hedge? Boxwoods or yews. They’ll be sheared multiple times a year by our crew of expert (and underpaid and exhausted) workers. At the first sign of new growth, we’ll be there mutilating your plants to ensure that they stay at right angles. 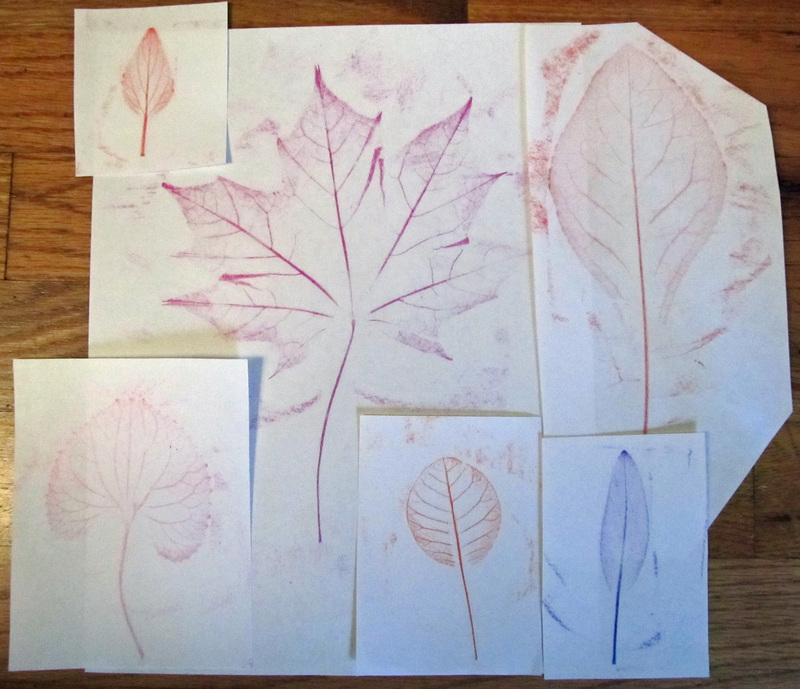 You see all of those ripped apart, discolored leaves on your shrubs? Ignore that; plants are meant to be tamed into perfect geometry. Oh, that’ll be an extra charge to spray insecticides and fungicides. Here’s a list of plants you can get to add to the monotony in your neighborhood: crabapple, hawthorn, cherry, honeylocust, blue spruce, oak, red maple, Japanese maple, pear, white pine, boxwood, yew, hydrangea, arborvitae, burning bush, and wax begonias. Why is your hemlock tree neon yellow? We don’t know, let’s just replace it. Why is your Norway maple declining? Well, when we planted it, we kept the cage on its root ball, despite this tree having notorious girdling roots. Let’s get you a new one. Why are some of your shrubs rotting out? We left the soaker hoses on them for years and kept them running regularly. Yes we can spray all of your plants. We can kill everything before it’s a problem. We’re the best landscapers in town! Our services are top of the line, and we guarantee your landscape will look exactly the same as your neighbor’s. That’s a very sardonic, hypothetical conversation between a homeowner and a landscape company. A sensible company knows you don’t know best. As a homeowner, it is wise to heed the advice of a company’s horticulturist. Cost is always a consideration for the homeowner. However, the more expensive company is not always the highest quality. Here’s why. So, you want a Colorado blue spruce? A responsible company won’t let you plant a blue spruce in a place with wet springs and humid summers. They will tell you why it is not a good idea, and they will suggest alternatives. For example, a concolor fir (Abies concolor) looks similar to a blue spruce. They are resistant to needle cast diseases and cytospora canker, and they can tolerate southeast Michigan’s alkaline soils. In the long run, it is much cheaper to get the right plant in the right place. You will pay more for your blue spruce because, not only are you paying for installation, you are paying to spray fungicides year after year to avoid having a skeleton in your yard. Companies know there is a likelihood of replacing your newly planted blue spruces, so you are charged for it. Maybe you do like the classic, formal look of hedges. And maybe you do like the texture offered by a boxwood or yew. That’s fine. This is the problem I see literally every single day: over-shearing. An appropriate cultivar selection is the answer. Cultivars and hybrids exist which only grow to x-amount tall and x-amount wide. Simply read the tag from the nursery. If your landscape company planted the proper plants the first time, they wouldn’t be able to charge you as much as they do to “maintain” them. The right plants in the right places need very little maintenance. I will concede, a few plants can tolerate being sheared. Once in a great while is acceptable; not three times a year. Excessive shearing stresses out a plant. 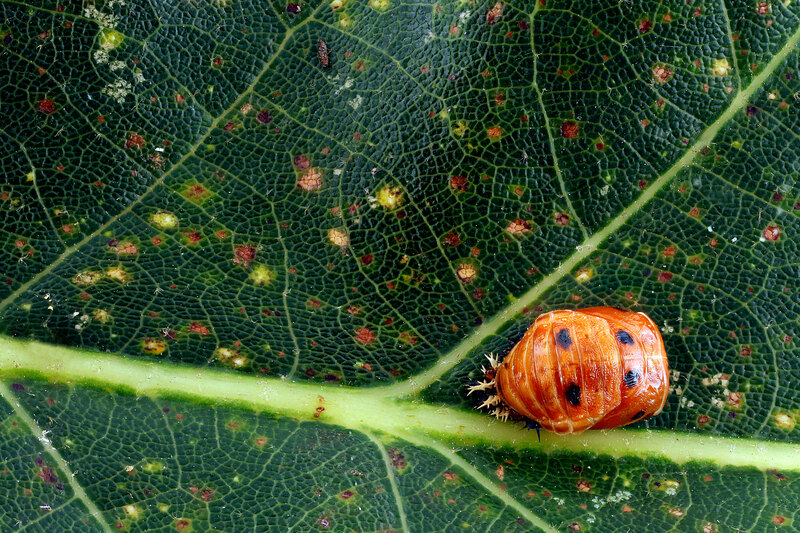 In fact, certain chemicals released by the open wounds of the leaves attract insects. Wet, exposed tissue serves as a breeding ground for fungi. Some of the problems your shrubs face are directly caused by the shearing itself. Any pruning book will explain that one prunes to open up the center of the plant, allowing air and light penetration to make the plant healthy. Shearing, on the other hand, creates a twiggy outer shell that gets ever denser and collects more deadwood and dead leaves every year, the opposite of a healthy condition. The results create the perfect protected place for pests and diseases, akin to locking up the house so the garbage can’t be removed. After many years, this treatment can lead to disease and general bad health without actually being a disease itself. If plants have mites and blights, bugs and mildews galore, how they were pruned may be the root of the problem. Not to mention, the plant is spending all of its energy regrowing those leaves you continually cut off. There are correct ways to prune plants, and none of them include the excessive use of motorized shears. A plant grows to reach an equilibrium with its environment. If the environment is adequate, the plant will grow. If the environment is unfavorable, the plant will decline. In other words, if it is growing, let it grow! There seems to be only 15 plants which are acceptable to the landscaper. The plant selection is predictable. Certainly there are more than 15 different species of plants you can have on your property. Sure, some redundant species are okay: white pines, oaks, maples (except that damned Norway maple). I don’t want to discourage people from exploring new options, though. Native plants offer easy beauty. They have evolved in your region for millennia and are therefore adapted to your environmental conditions. 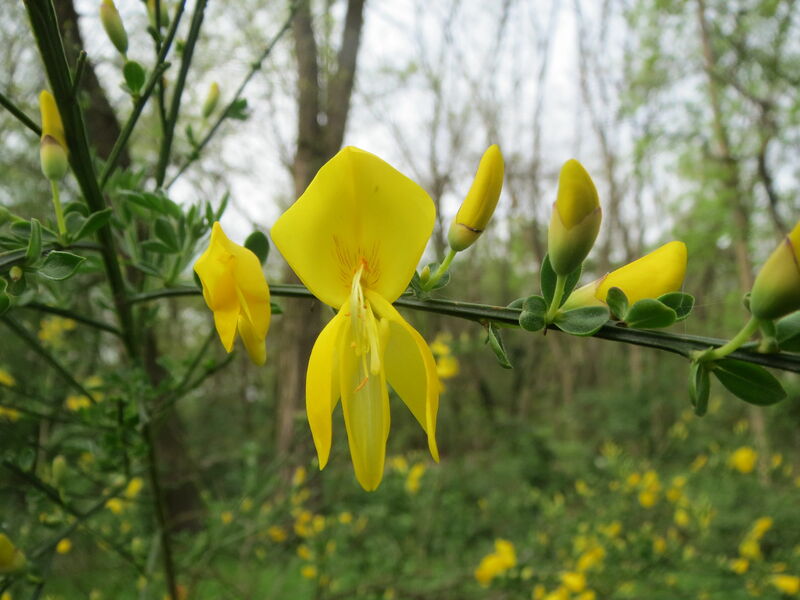 These plants often tolerate both biological and environmental stressors better than non-native plants. Expenses are saved when you don’t have to pay for disease control. You wouldn’t buy a vehicle, for example, that you know would break down and require fixing all the time. There are dozens of other shrub options for texture, winter interest, privacy walls, etc., that you don’t have to hire a crew to shear every month. 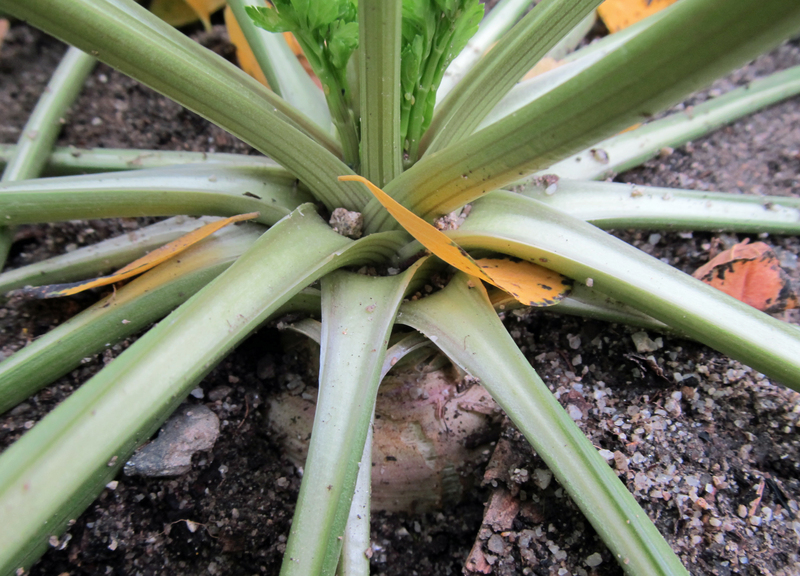 Surprisingly, some large yucca species are hardy in colder zones, which offer a different texture. Red-twig dogwoods provide colorful winter interest; there are red, green, and yellow-stemmed cultivars. Coyote willow is native to southeast Michigan. It is a thin-leafed, rhizomatous Salix species which forms beautiful yellow walls in the fall. An entire, separate article can be written on the subject of alternatives. Just know there are plenty of species to choose from no matter where you live. This request comes from homeowners and is often fulfilled by companies: “Can’t you just spray it?” Granting this request is entirely wrong. One cannot, by law and by principle, go around as a pesticide desperado. You live in that environment. Why would you want pesticides in excess? Chemicals are used as a last resort and strictly on an as needed basis. Appropriate timing, safety precautions, and proper insect identification are all legally required before insecticides can be applied. Some of the ‘yes’-type companies will comply with all uneducated (and sometimes unsafe) requests. There’s a myriad of things that can go wrong in a landscape. It is an artificial environment containing plants which evolved continents apart. Plants often don’t have the capacity to combat pathogens that they are not exposed to in their native habitats, but certain issues are impossible to predict. There is a base knowledge one should have before making these kinds of decisions. The “customer is always right” philosophy doesn’t apply in this domain. You should have some creative influence on your landscape; it’s yours, after all. Spend the time in the nursery looking for interesting plants, make a list, and run it by your landscaper. If they say ‘yes’ to all of your choices, fire them. The people you hire cannot be too timid to tell you ‘no’ sometimes. “Right plant, right place” is the mantra among plant health care technicians. We are the people who have to clean up the messes made by your landscapers. If your landscaper did their job with longevity in mind, I probably wouldn’t have much to do. The spring season for plant-obsessed gardeners is a time to prepare to grow something new and different – something you’ve never tried growing before. 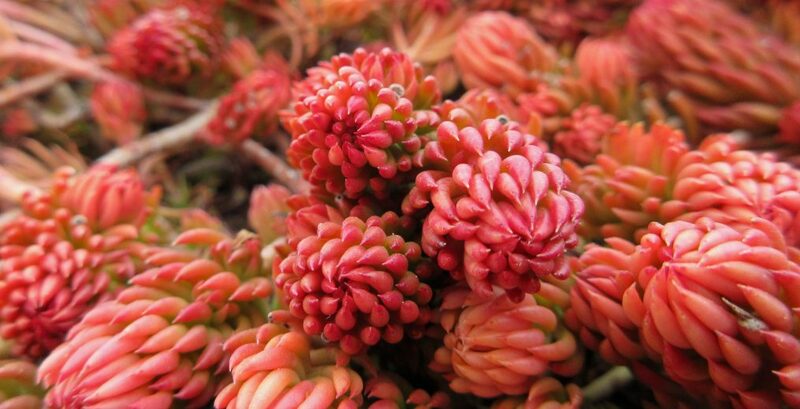 Sure, standards and favorites will make an appearance, but when you love plants for plant’s sake you’ve got to try them all, especially the rare and unusual ones – the ones no one else is growing. Even if it ultimately turns out to be a disaster or a dud, at least you tried and can say you did. 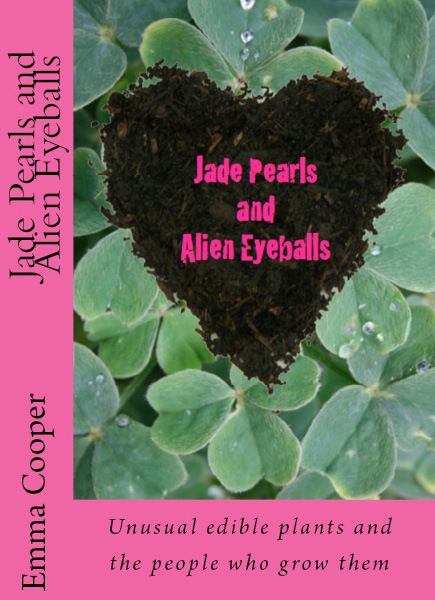 That seems to be the spirit behind Jade Pearls and Alien Eyeballs by Emma Cooper. Subtitled, “Unusual Edible Plants and the People Who Grow Them,” Cooper’s book is all about trying new plants, both in the garden and on your plate. While its focus is on the rare and unusual, it is not a comprehensive guide to such plants – a book like that would require several volumes – rather it is a treatise about trying something different along with a few recommendations to get you started. Cooper starts out by explaining what she means by “unusual edible” – “exotic, old-fashioned, wild, or just plain weird.” Her definition includes plants that may be commonly grown agriculturally but may not make regular appearances in home gardens. She goes on to give a brief overview of plant exploration throughout history, highlighting the interest that humans have had for centuries – millennia even – in seeking out new plants to grow. 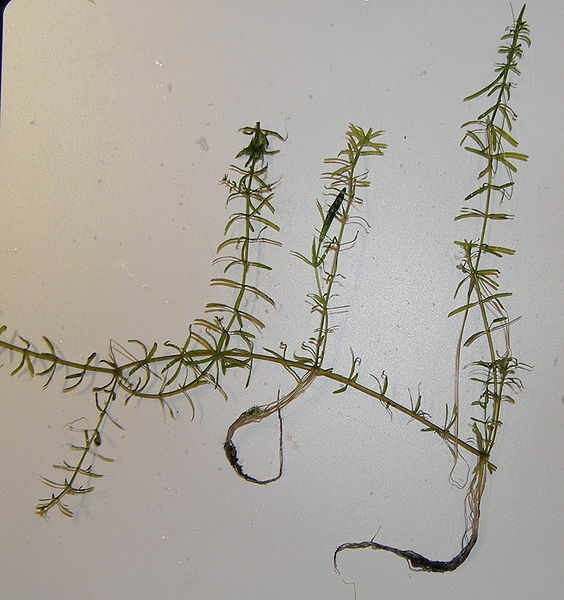 She acknowledges that, in modern times, plant explorations have shifted from simply finding exotic species to bring home and exploit to cataloging species and advocating for their conservation in the wild. Of course, many of these explorations are still interested in finding species that are useful to humans or finding crop wild relatives that have something to offer genetically. Cooper then includes more than 2o short interviews of people who are growers and promoters of lesser known edible plants. The people interviewed have much to offer in the way of plant suggestions and resource recommendations; however, this part of the book was a bit dull. 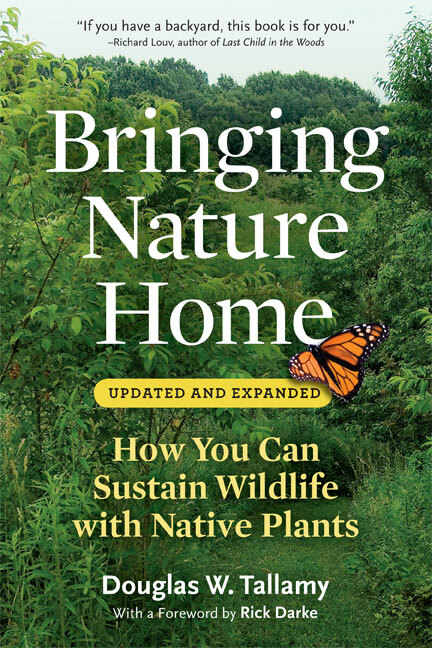 Cooper includes several pages of resources at the end of the book, and many of the interviewees suggest the same plants and resources, so this section seemed redundant. That being said, there are some great responses to Cooper’s questions, including Owen Smith’s argument for “citizen-led research and breeding projects” and James Wong’s advise to seek out edible houseplants. The remainder of the book is essentially a list of the plants that Cooper suggests trying. Again, it is not a comprehensive list of the unusual plants one could try, nor it is a full list of the plants that Cooper would recommend, but it is a good starting point. Cooper offers a description of each plant and an explanation for why it is included. The list is separated into seven categories: Heritage and Heirloom Plant Varieties, Forgotten Vegetables, The Lost Crops of the Incas, Oriental Vegetables, Perennial Pleasures, Unusual Herbs, and Weeds and Wildings. This is the portion of the book that plant geeks are likely to find the most compelling. It is also where the reader learns where the title of the book comes from – “jade pearls” is another common name for Chinese artichoke (Stachys affinis), and “alien eyeballs” is Cooper’s name for toothache plant (Acmella oleracea). 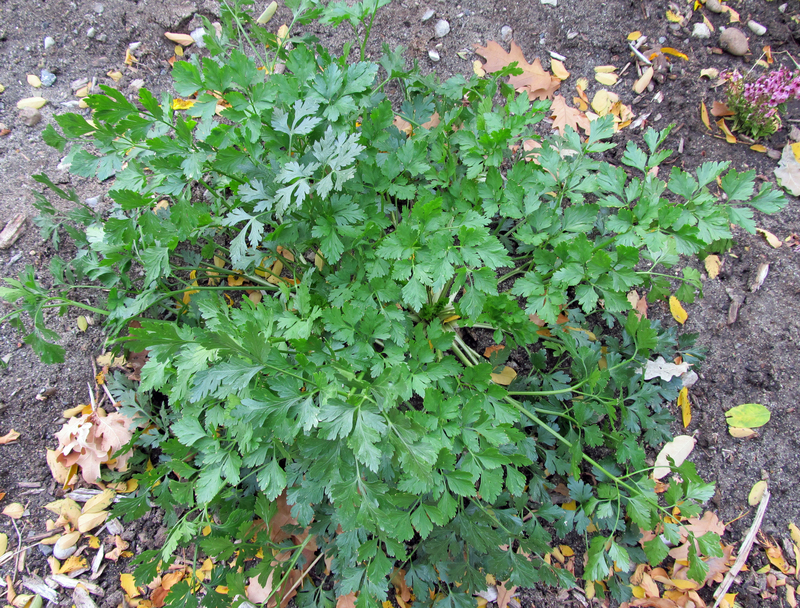 I have tried a few of the plants that Cooper includes, and I was intrigued by many others, but for whatever reason the two that stood out to me as the ones I should try this year were Hamburg parsley (Petroselinum crispum var. 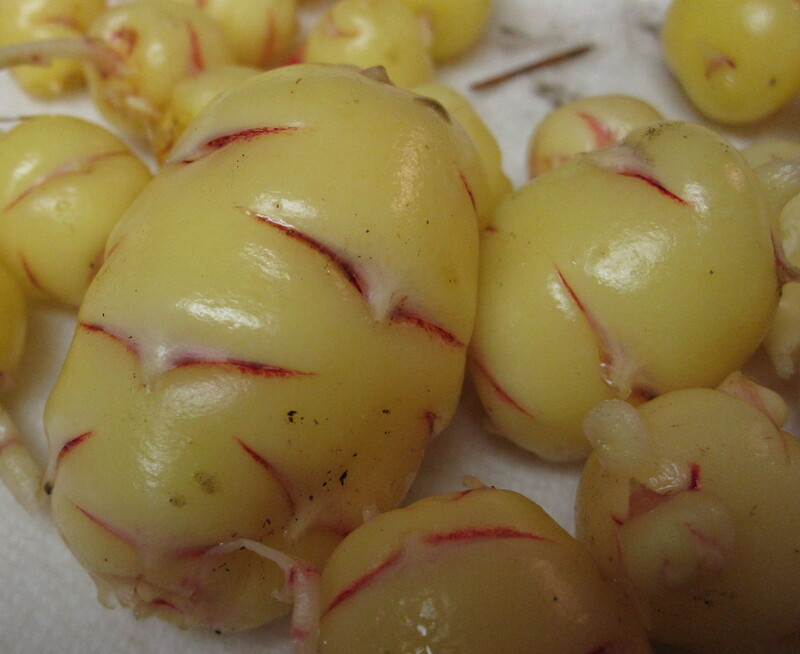 tuberosum) and oca (Oxalis tuberosa). 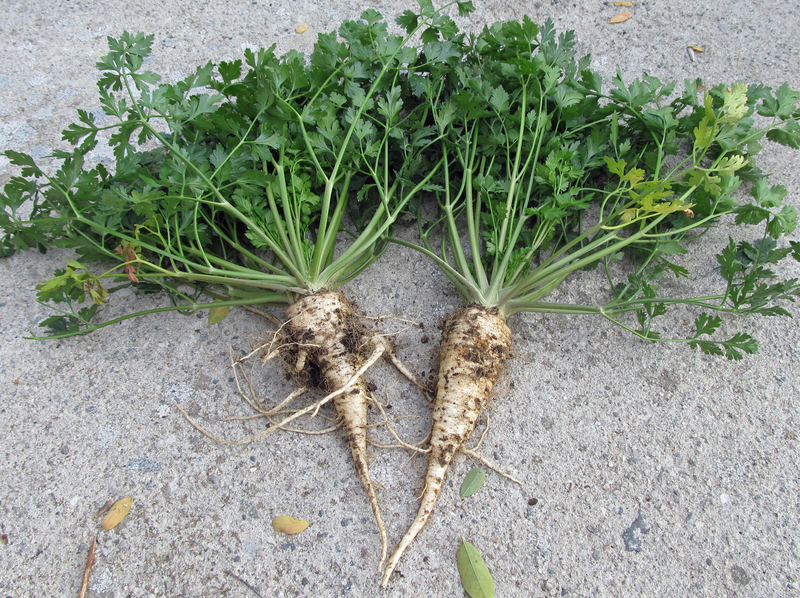 In the final chapter, Cooper offers – among other things – warnings about invasive species (“our responsibility is to ensure that the plants we encourage in our gardens stay in our gardens and are not allowed to escape into our local environment”), import restrictions (“be a good citizen and know what is allowed in your country [and I would add state/province], what isn’t, and why”), and wild harvesting (“act sustainably when foraging”). She then includes several pages of books and websites regarding unusual edibles and a long list of suppliers where seeds and plants can be acquired. Cooper is based in the U.K., so her list of suppliers is centered in that region, but a little bit of searching on the internet and asking around in various social media, etc. should help you develop a decent list for your region. International trades or purchases are an option, but as Cooper advises, follow the rules that are in place for moving plant material around. 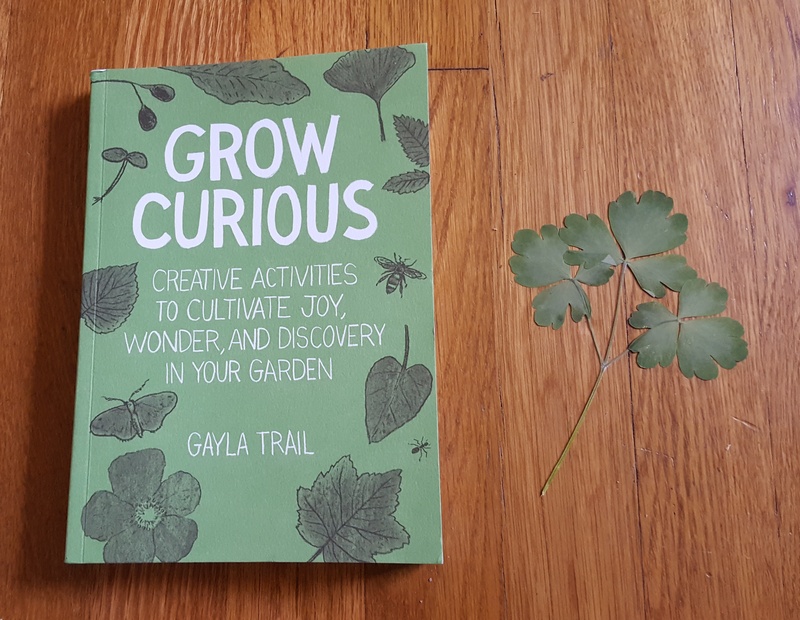 Bottom line: find some interesting things to grow this year, experiment with things you’ve never tried – even things that aren’t said to grow well in your area – and if you’re having trouble deciding what to try or you just want to learn more about some interesting plants, check out Emma Cooper’s book. Also, check out Emma Cooper’s blog and now defunct podcast (the last few episodes of which explore the content of this book). Are you interested in writing a book review for Awkward Botany or helping out in some other way? If so, go here.